Day in and day out, most of us feed the same food to our pets. For the most part that is just fine, but I think it is easy to add some variety to your pet’s diet. Most people feed a dry kibble to their pets. In deciding which kibble to use, make sure it is of a high quality. This means it does not include the common allergens of soy, wheat and corn, while it does includes the healthy oils like canola, flax seed, fish or salmon oils. Of course, stay away from foods that contain chemical perservatives. If you’re already doing this, you are off to a great start. Now, let’s spice the basics up with a little variety. For the kibble, I use a Solid Gold brand. 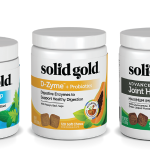 Solid Gold offers beef, lamb, chicken, bison & fish proteins. It’s fine to rotate the base food a couple of times a year. If you stay within the same food line it should make for an easy change for your pet. Then, on a daily or weekly basis, add variety by mixing some canned food with the dry kibble. Canned foods are high in moisture (good for the kidneys). Dogs do well on canned food, and by mixing in only a couple of spoonfuls daily, a can may last up to a week. You can also add water to make it “gravy” like. Select canned products that are meat based. Common canned foods are chicken, turkey, lamb, fish and tripe. 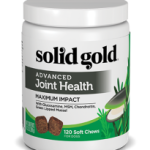 Solid Gold offers Green Cow Tripe Canned Dog Food. Tripe is made up of stomach and intestines and while it doesn’t sound good to us, most cats and dogs love the taste of tripe. Tripe is very nutritious for pets, as it is a great source of enzymes and easy on sensitive stomachs. By the way, canned food is good for picky eaters and, if your pet is not eating well, canned food can be great way to keep them eating, by bringing in a wider array of ingredients and interest. Have fun with it, give Solid Gold Green Cow Tripe a try. If you have any questions about this, contact Solid Gold Northland. You and your dog will be happy you did.